March Madness means weeks of dedicated viewing time as fans watch with anticipation leading up to the Final Four. Big game excitement also means big appetites and an exciting menu can keep your guests as satisfied with the food as they are with the game. So if you’re looking for exciting eats, French’s® Foods has some great recipe ides featuring two of America’s favorites: French’s Mustard and French’s French Fried Onions. CRUSH French Fried Onions with flour in plastic bag. 2. Dip chicken tenders into egg and COAT in onion crumbs. 3. BAKE 15 min. at 400°F until chicken is cooked. Look for FRENCH'S® French Fried Onions in the canned vegetable aisle! Make Ahead Tip: Prepare chicken tenders through step 2. Place on baking sheet and cover with foil. Refrigerate several hours or overnight. Bake, uncovered, just before serving. A great make-ahead platter of French’s Crunchy Onion Chicken Fingers can quiet even the rowdiest of crowds. Featuring French’s French Fried Onions, America’s #1 brand, that have been crushed to create a crispy, crunchy coating, this recipe takes only 10 minutes of prep time and is ready to serve in less than thirty minutes. It’s so easy too, just Crush, Coat & Bake. 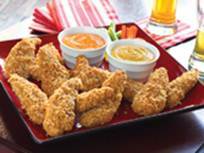 Serve it up with some French’s Honey Mustard Dipping Sauce and both kids and adults will be begging for more. French’s Honey Mustard Dipping Sauce also tastes great with pretzel sticks, veggies and even Chinese dumplings. Delicious! What a fun meal! We love French's Onions on chicken, have you tried their cheddar flavor, my kids do not share when I make it! I would love to try this recipe, we love French's Fried onions. Problem is my hubby likes them straight out of the can, so if I don't hide them they are gone before I can cook with them!